People with visual impairments are at a huge disadvantage in finance. Our goal is to close this gap by making financial visualizations more accessible. Note: this project is a work in progress. Our team is currently working at Bloomberg HQ in NY until August 2017 designing, prototyping, and building solutions. This story reflects four months of research and synthesis into the domains of finance and accessibility. You have to make an investment decision based on an untitled image you can't see. Listen to a bit of this audio clip and make a buy or sell decision. This is the table you heard. This is how much of the table the audio clip above reads. This is a visualization of that table. As this example illustrates, people with visual impairments (PWVI) are at a huge disadvantage when it comes to making decisions like these, be it in a professional setting, or when managing personal finances. For our masters' capstone project, we were asked to explore the domains of finance and visual accessibility, with the goal of giving PWVI better access to financial visualizations and other information. The first step was to quickly become experts in designing for accessibility. Our sensemaking "affinity model" of our secondary research. 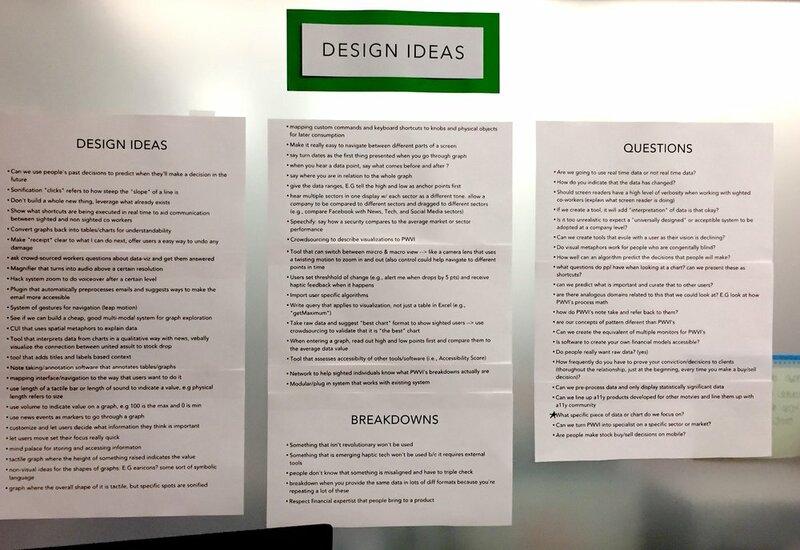 Since we're focused on nonvisual means of communication, one of our teammates completed a survey of emerging technologies to give us a better idea of what tools we might be able to use, and understand their limits. We conveyed our findings to our client through our secondary research report, offering five insights to help guide our contextual inquiry, as well as our future product designs. I was responsible for the insight portion of this report, as well as the visual design of the report. Check out our full report if you'd like to learn more. For our visual design, we chose a layout suitable for a research report. I also developed a style guide that was formal, but still offered a bit of flair. One PWVI interviewee customizes his bluetooth keyboard with tactile stickers to find his place while typing. A list of design ideas generated by “walking the wall” of the affinity diagram. Design ideas plotted in terms of difficulty of implementation and solution impact. People who help me are interfaces too. The transfer of information by a sighted person is subject to that person’s interpretation and expertise. My assistive technology only provides one piece of information at time. Changing technology is difficult, so it better be worth it. I designed this book as well. I refined our branding and added more variation amongst the grid and page layouts. Check out my book design, here. 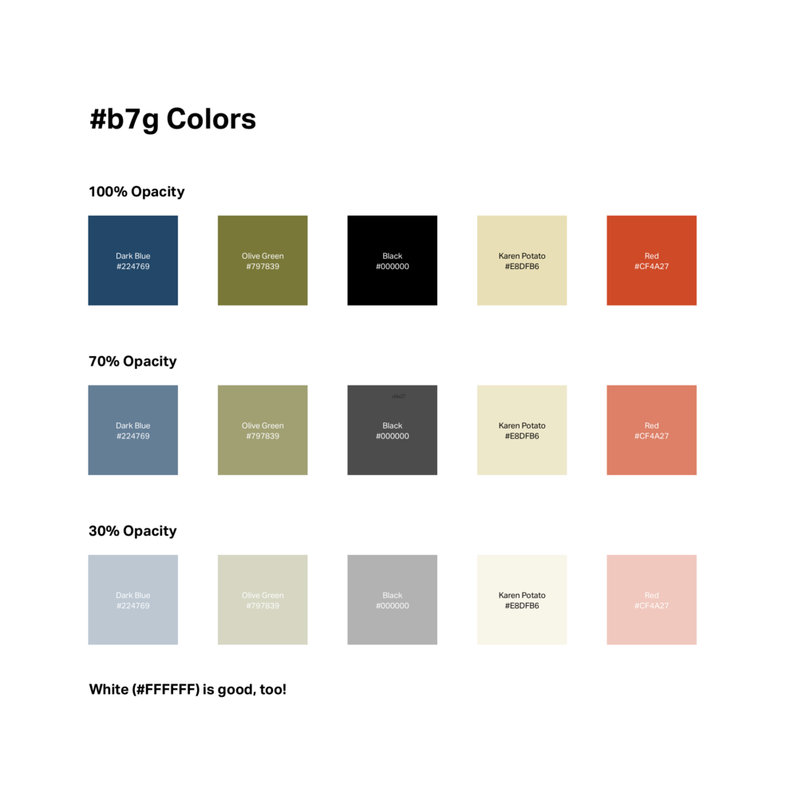 I also updated our style guide to high contrast colors for visual accessibility. Team B7G is currently in Manhattan at Bloomberg HQ for the summer. Stay tuned for a summer of designing, prototyping, user testing, and building!